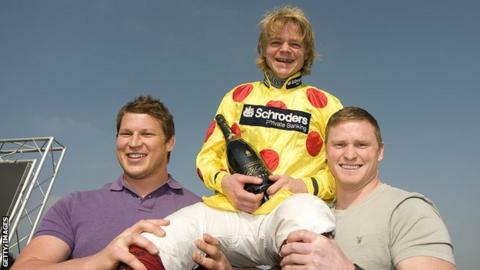 Thornton is held aloft by England rugby players Dylan Hartley (left) and Chris Ashton after riding the 1,000th winner of his career at Towcester in 2011. Jump jockey Robert Thornton has retired from racing due to injury. The 37-year-old has not ridden since fracturing vertebrae in a fall at Chepstow in April last year. Thornton - better known as 'Choc' in racing circles - enjoyed a string of successes in big races with trainers Alan King and David Nicholson in his 20-year career. "I'm sad to be retiring, but I've had a career I can look back on with pride," he said. Thorton had undergone physiotherapy at Oaksey House, the Injured Jockeys Fund rehabilitation centre, since falling from Say When. He had hoped to make a comeback but "ongoing issues with my neck and upper limbs" meant he was left with "no choice but to retire". Meanwhile, fellow jump jockey Paul Carberry says he could be out until 2016 after breaking his left leg in a fall at Listowel on Saturday. The 41-year-old Irishman was due to be transferred to hospital in Dublin on Monday following an operation. "Op went well. Off now three to four months, will go insane," he tweeted.